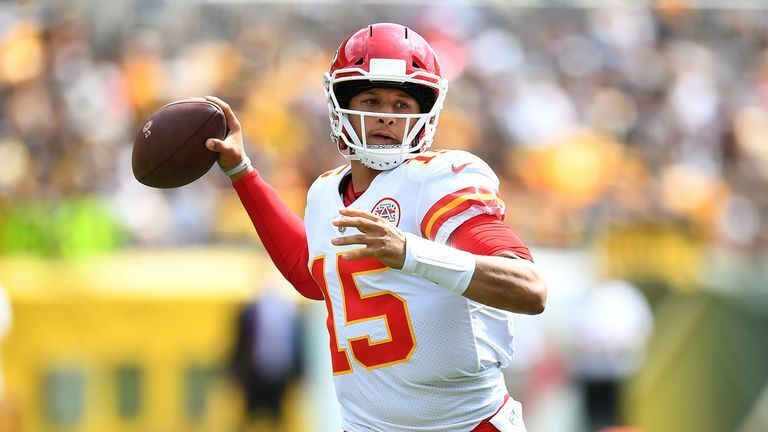 Patrick Mahomes threw six touchdowns as the Kansas City Chiefs beat the Pittsburgh Steelers 42-37. The second-year starter completed 23 of 28 passes and threw scores to five different receivers in a stunning offensive performance. Ben Roethlisberger threw the ball 60 times and had 452 yards and three passing touchdowns of his own, but it wasn't enough to stop Andy Reid's high-flying Chiefs offense. Kansas City started out hot and were up 21-0 in the first quarter. Mahomes found Chris Conley, Travis Kelce, and Kareem Hunt and was slicing through the Steelers' defense. However, it was a different tale in the second period. Roethlisberger completed a three-touchdown comeback with a flip to receiver James Washington after tossing a pair of scores to Jesse James and JuJu Smith-Schuster. 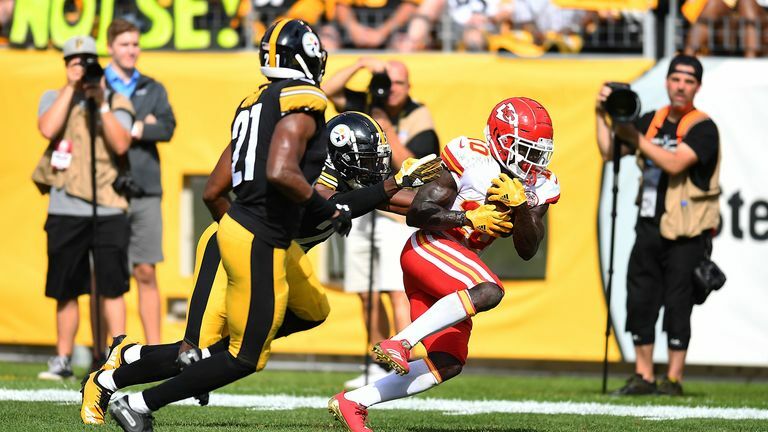 In the second half, the Chiefs continued their attacking onslaught with another Kelce touchdown from Mahomes, but James Conner answered for Pittsburgh with a one-yard spin into the end zone. But ultimately, Mahomes' fifth and sixth touchdowns, to Demarcus Robinson and Tyreek Hill respectively, gave Kansas City an insurmountable lead into the fourth quarter. The late resurgence came when Hunt was forced down in his end zone, giving the Steelers two points on the safety. Soon after, Roethlisberger sprinted to the pylon for a three-yard rushing TD to bring his team within one score. A round up of all the best stories from Week Two in the NFL. Kirk Cousins came close to delivering a dramatic comeback in the second half, but Minnesota (1-0-1) and Green Bay (1-0-1) ultimately had to settle for a tie. Cousins, who had 425 passing yards and four touchdowns, set up the Vikings for a game-winning 35-yard field goal, but rookie Daniel Carlson missed wide right to end the game. That was his second missed field goal in overtime and third on the day. Packers kicker Mason Crosby too missed a 52-yarder as time expired in regulation. Ryan Fitzpatrick threw four touchdown passes as Tampa Bay (2-0) held on to defeat defending Super Bowl champions Philadelphia (1-1). Fitzpatrick, who also tossed four TD passes in the Buccaneers' season-opening win over New Orleans, became the first quarterback in league history to throw for at least 400 yards and four touchdowns in consecutive games to open a season. 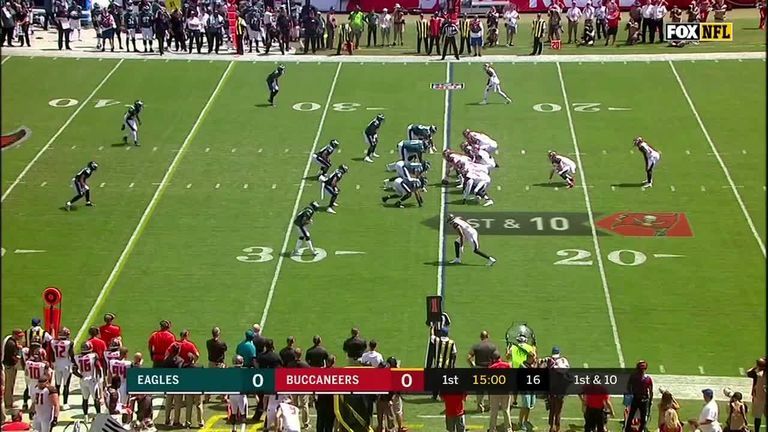 Tampa Bay QB Ryan Fitzpatrick connects with wide receiver DeSean Jackson for a 75-yard touchdown. Drew Brees connected on a pair of short touchdown passes to Michael Thomas in a six-minute span of the fourth quarter, and Wil Lutz kicked a 44-yard field goal with 21 seconds to lift New Orleans (1-1) over still-winless Cleveland (0-1-1). The Browns had a chance to force overtime for the second consecutive week, but kicker Zane Gonzalez pushed a 52-yard field-goal attempt wide right with three seconds remaining. Gonzalez also missed two extra points and a 44-yard field-goal attempt earlier in the game. 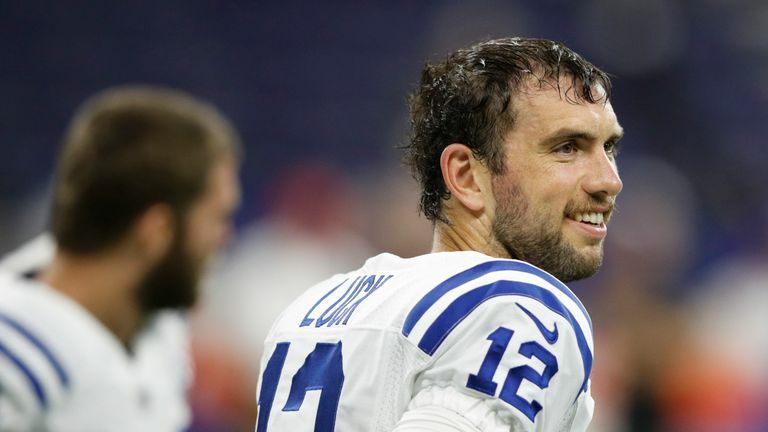 Andrew Luck threw a pair of touchdown passes, and the Indianapolis (1-1) defense kept hosts Washington (1-1) out of the endzone to clinch a convincing road win. Indianapolis quarterback Andrew Luck says he has a different perspective on things having returned to the game following injury. Philip Rivers threw for 256 yards and three touchdowns to lead Los Angeles (1-1) to a first win of the season over Buffalo (0-2) in Bills rookie quarterback Josh Allen's first NFL start. Allen was 18 of 33 passing for 245 yards, one touchdown and two interceptions. 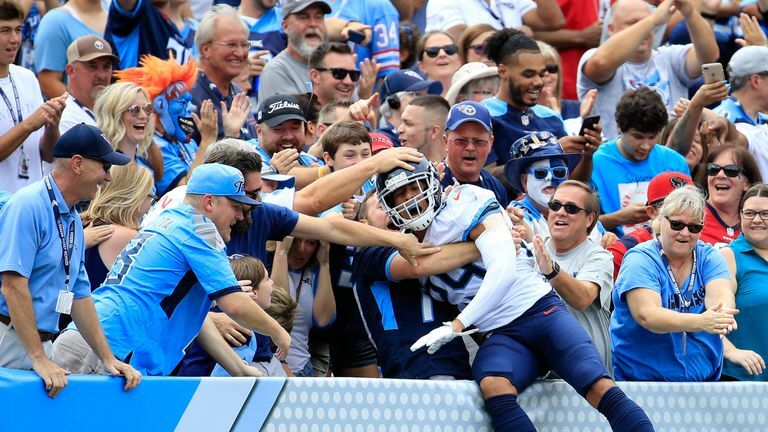 He connected with Kelvin Benjamin on a three-yard pass for his first career TD with 38 seconds left in the game. Blaine Gabbert orchestrated a late drive that resulted in a field goal to give Tennessee (1-1) a tight victory against visiting Houston (0-2), and earn first-year head coach Mike Vrabel a first NFL win. 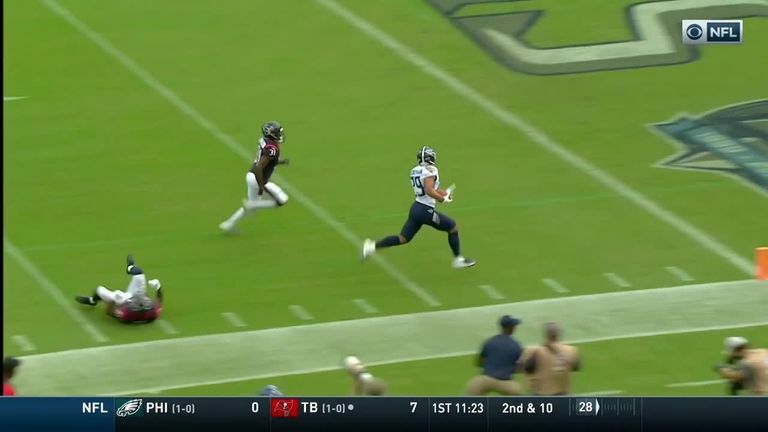 Titans safety Dane Cruikshank throws it to fellow safety Kevin Byard for an impressive 66-yard strike on a fake punt. The Atlanta (1-1) offense bounced back impressively from a sub-par outing in the season opener, recording touchdowns on all four of their redzone possessions in a victory over NFC South divisional rivals Carolina (1-1). Do the Steelers miss Le'Veon Bell? Ryan Tannehill threw two touchdown passes as visiting Miami (2-0) held on for victory against New York (1-1) and rookie quarterback Sam Darnold. Darnold couldn't get the Jets into the endzone enough despite completing 25 of 41 throws for 334 yards. He threw one touchdown pass and was intercepted twice.